Slow Cooker Thai Peanut Chicken is a creamy, peanut flavor infused chicken that is served over thick, rich noodles. Easy to make in just a couple steps adding all the ingredients together letting the slow cooker do the work for you! Enjoy the smells that will fill your home while cooking during the day. Ingredients that you already have in your pantry is added all together to create this flavorful meal that is sure to please. Simple ingredients, easy to follow instructions equals one main dish that everyone loves and raves about. 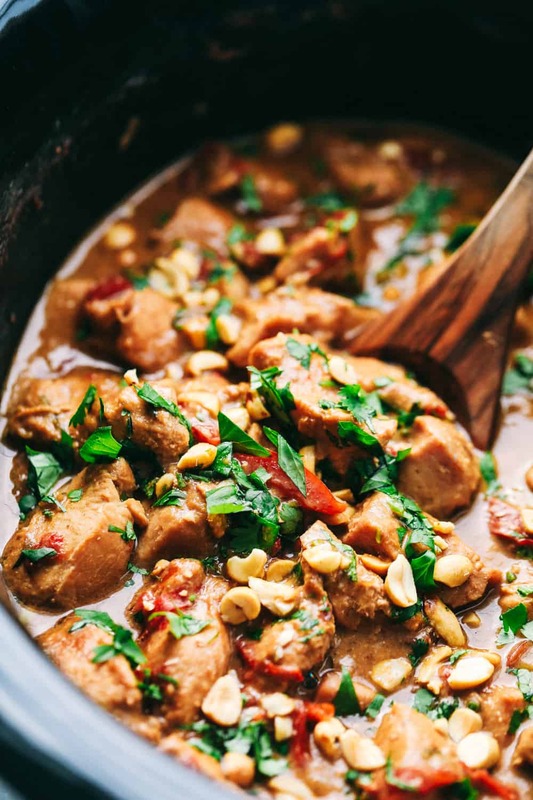 Looking for more slow cooker recipes to make during the week try this Slow Cooker General Tso’s Chicken, Slow Cooker Lemon Garlic Chicken Thighs and Veggies, or Slow Cooker Porcupine Meatballs. Dang this was so good! My little 8 year old said this was one of the best chicken dishes that I have made. Do you wanna hear the best part? It has 1 cup of zucchini in it and red pepper in it and he couldn’t even tell! I love being able to trick kids into eating veggies and having them actually love it. This dinner was a success. Well for most of us. The pickiest 4 year old wouldn’t even try a bite. What am I going to do with that boy? And when will he learn that my cooking isn’t horrible! 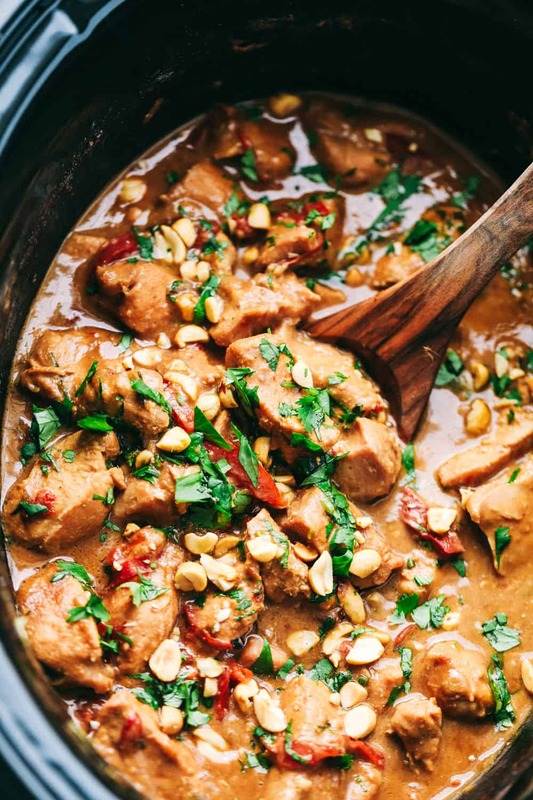 How Do You Make Slow Cooker Thai Peanut Chicken? Add garlic, peanut butter, broth, chicken, zucchini, soy sauce, sugar, and red pepper to slow cooker. Stir to combine. Cook on low for 4-5 hours or on high for 2-3 hours. A half hour before you are going to serve, add in lime juice and 1/2 cup of cilantro. Serve over noodles and garnish with remaining cilantro and peanuts. 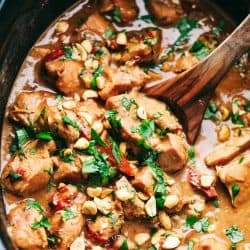 Can you make Thai Peanut Chicken ahead? Yes! You can make the sauce one week ahead to start prepping for it the next day. Add the chicken and follow the instructions according to the recipe card. It can be stored in an air tight container for 3 to 4 days in the fridge and up to 1 month in the freezer. 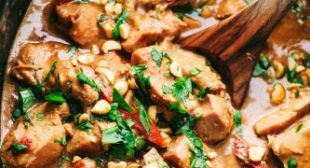 What type of noodles are best for Thai Peanut Chicken? I prefer a thicker noodle that soaks up the creamy sauce and usually serve it with fettuccine noodles. The sauce is thicker than most and the fettuccine noodles are able to accurate this meal. Linguine is also a great choice with a lighter touch to the sauce since the noodles are a bit slimmer. 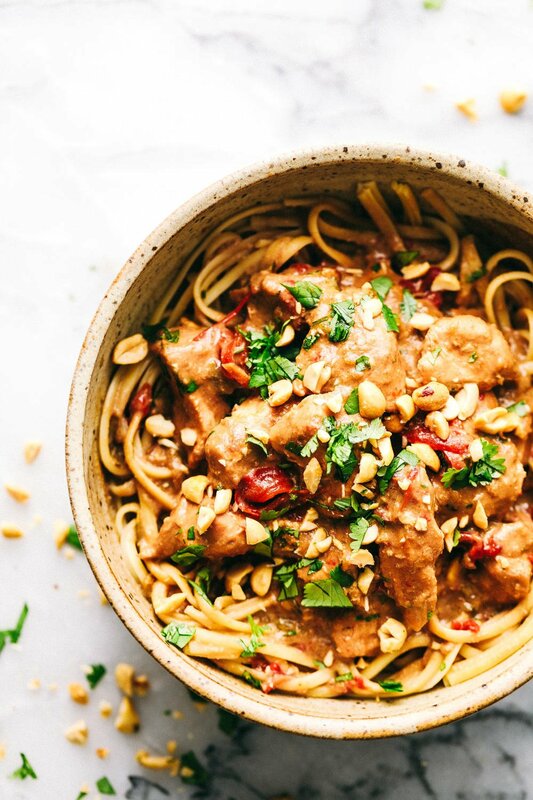 Either noodle is a great option for the Thai Peanut Chicken. What type of Peanut Butter is used? I like to use a creamy peanut butter for this meal. If you prefer a crunchier/chunky, texture sauce chunky peanut butter would be a great option too. How do you minced garlic? Note: Garlic Powder is not the same as minced garlic even though they come from the same bulb. This can alter the taste and texture of this dish. 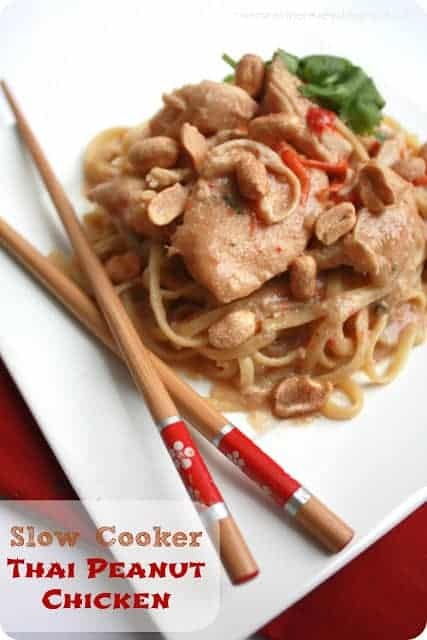 Slow Cooker Thai Peanut Chicken is a creamy, peanut flavor infused chicken that is served over noodles. Easy to make in just a couple steps adding all the ingredients together letting the slow cooker do the work for you! Enjoy the smells that will fill your home while cooking during the day. Add garlic, peanut butter, broth, chicken, zucchini, soy sauce, sugar, and red pepper to slow cooker. Stir to combine. Cook on low for 4-5 hours or on high for 2-3 hours. A half hour before you are going to serve, add in lime juice and 1/2 cup of cilantro.